Luckily for New Yorkers, a new gelato shop has just opened it's doors in West Village. 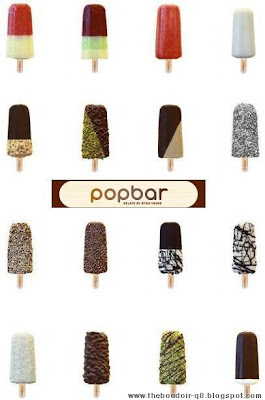 Popbar. And I'm loving what I'm seeing! It's an all popsicle shop. Popsicles are made of dairy gelato, frozen yogurt, and sorbet using fresh ingredients with no artificial flavoring and colors. You can dip the popsicle in milk, dark, or white chocolate sauce plus top it with almonds, pistachios, hazelnuts, shredding coconut, granola, coffee grains, brownies chunks, and biscotti crumbs. Tempting? I like the fact that a retro mould is used for all popsicles gives it a vintage nostalgic feel. Elsa3a 5 el3a9er o ana ga3da athoub in college, yabeelah wa7ed right now !